Two new Pickaway County properties were recently added to AOA’s Big Darby Creek Conservation Corridor. Big Darby Creek is a National and State designated Scenic River that is recognized as one of the most diverse waterways in the Midwest. 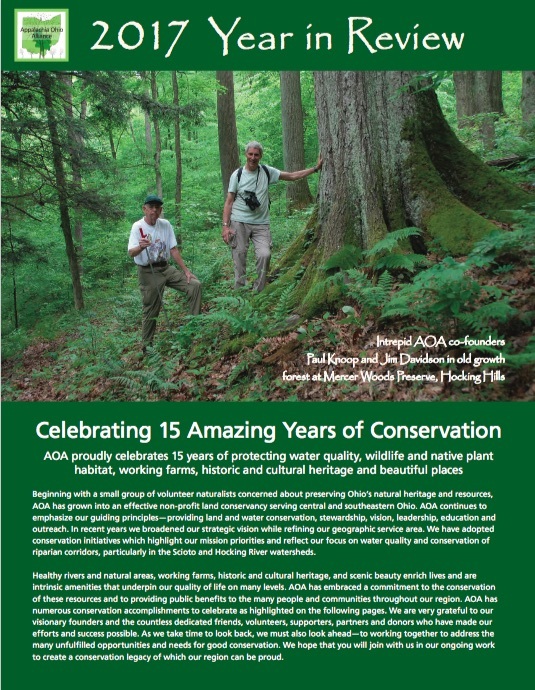 Through this Initiative, AOA seeks to preserve riparian properties and to create a continuous corridor of connected conservation lands to safeguard water quality, natural habitat and scenic qualities of the river. AOA recently closed on the 276-acre Fickardt Farm property located on the west side of the Big Darby, between Circleville and Darbyville. Fickardt Farm is just south of AOA’s existing 50-acre Steward Preserve. This site will protect 4,440 linear feet of riparian corridor along Big Darby Creek. The property includes 1,900 linear feet of old river oxbow that has transitioned into a linear wetland. About 100 acres of the property is relatively mature forest which provides habitat for local bat populations. Much of the 125 acres of flood plain area along the river is currently in dry season agricultural fields that will be returned to bottomland forest habitat. Numerous headwater streams discharge into the floodplain area creating opportunities for new wetland habitats as the property is restored. Fickardt Farm is the first property to be conserved as part of AOA’s collaboration with ODOT, EnviroScience and The Conservation Fund to increase habitat suitable for supporting rare bat species in Ohio, such as the endangered Indiana Bat. The property is located within the home range of numerous Indiana Bats identified during recent bat studies and surveys. AOA previously acquired Mishe Moneto, a 255-acre property along Big Darby Creek adjacent to Darbyville. This property includes lands on both sides of the Big Darby, with 1.8 miles of riparian frontage along the river (6,740 on the east side and 2,750 on the west). AOA’s 119-acre Cline-Hunzinger Preserve lies just upstream from this site. Mishe Moneto consists largely of forested slopes and riparian corridor. Much of the forest cover is mature. There are several old river oxbows and significant wetland areas on the property. Big Darby Creek alongside the property is home to numerous species of mussels including five that have been listed as threatened and/or endangered. Recent bat studies along the Big Darby identified a number of trees supporting summer maternity colonies of endangered Indiana Bats on the Mishe Moneto property. In addition, the site functions as home range for numerous Indiana Bats that were mist-netted and radio-tracked as part of the studies. Mishe Moneto was conserved with funding from a variety of sources including monies from Clean Ohio, The Conservation Fund and Water Resource Restoration Sponsor Program, provided by municipal sponsors and administered by The Ohio Department of Environmental Protection (OEPA). OEPA recently completed an environmental assessment process for Mishe Moneto and other potential bat habitat properties in the area. A complete copy of the environmental assessment may be found here.